Apple today updated its investor relations page to announce that it will share its earnings results for the first fiscal quarter of 2018 on Thursday, February 1. The earnings report will give us our first real look at iPhone X sales, as well as sales of the iPhone 8 and the iPhone 8 Plus throughout the holiday quarter. The iPhone X did not go on sale until November 3, and it was not included in Apple's fourth quarter earnings report. Guidance for the first fiscal quarter of 2018 includes expected revenue of $84 to $87 billion and gross margin between 38 and 38.5 percent. It will be a record setting quarter even at the low end of the guidance range, as Apple saw $78.4 billion in revenue in Q1 2017. Apple's quarterly earnings statement will be released at 1:30 p.m. Pacific/4:30 p.m. Eastern, with a conference call to discuss the report taking place at 2:00 p.m. Pacific/5:00 p.m. Eastern. MacRumors will provide coverage of both the earnings release and conference call on February 1. The numbers for Apple are just staggering at this point. No one can deny that. This will no doubt be a blowout quarter for Apple. I fully expect them to be at the upper end of the $84-$87 Billion estimated revenue. The iPhone X will have sold quite well as demand wasn't satisfied until very close to the end of December; basically they sold all they could make this quarter. This should drive average selling price and revenue well up compared to Q1 of last year. What will be telling is the next quarter's estimates. Initial demand for the X has been met. The anticipated product shortages through the 2nd quarter aren't happening. I'm thinking demand for a $1,000 phone that appeals to people with discretionary income is going to be very heavily weighted toward the introduction date. You will still have the normal consumer purchases during the remainder of the year but I don't think the iPhone X will make up a significant percentage of sales. My baseless prediction for 2nd quarter revenue estimates is $52 - $54 billion as the iPhone X supercycle plays out, unit sales continue to plateau at around 225 million annually, and the lower cost iPhone 7 models account for a higher percentage of the remaining sales until next year's models come out in September. 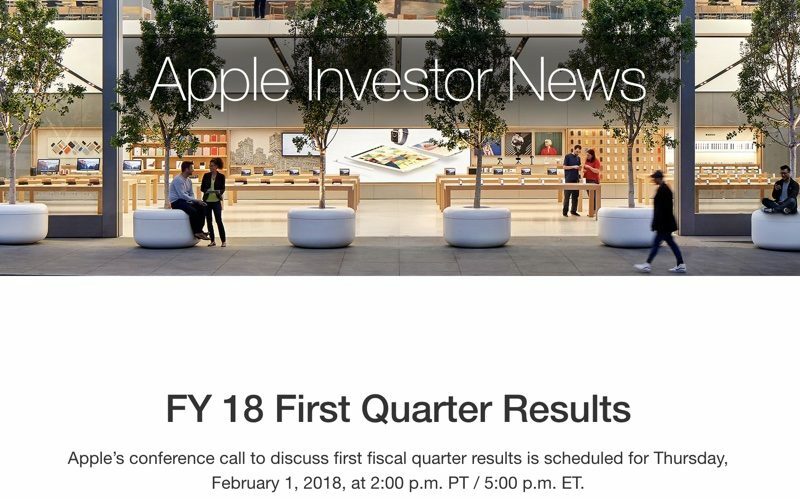 Apple today updated its investor relations page ('http://investor.apple.com') to announce that it will share its earnings results for the first fiscal quarter of 2018 on Thursday, February 1. The earnings report will give us our first real look at iPhone X sales, as well as sales of the iPhone 8 and the iPhone 8 Plus throughout the holiday quarter. The iPhone X did not go on sale until November 3, and it was not included in Apple's fourth quarter ('https://www.macrumors.com/2017/11/02/earnings-4q-2017/') earnings report. Repatriation of offshore moneys into the US will spark majors acquisitions across 2018, partnerships for foundries. Software suite will get major upgrades with requirement or option for more cloud storage purchases. I have a gut feeling that Apple will use the bulk of its repatriated cash for share buybacks. Apple doesn't strike me as the sort of company who does large scale acquisitions (like Netflix or Disney) solely for recurring revenue. They will snap up smaller companies from time to time, but that's mainly for the manpower and talent. I've sold 30% of my shares just before Christmas as the stock will officially enter silly season after earnings. Why? I mean are you a trader or investor? If investor: was the value of your AAPL as a % of your entire portfolio getting to big and needed to diversify? Just needed the money? Dimming view of Apple's long term growth? Just selling because of the silly season doesn't seem like a valid reason for an investor to sell. A trader, sure: buy on the rumor, sell on the news. Oh and larger stock buy back program with stock split (3:1), increase dividends. Looking forward to this. Doing a stock split along with a buyback makes zero sense. One increases outstanding share, the other reduces. Either a company wants to lower the share price in an effort to get smaller fish interested or it wants to try to pump up the price by taking shares out of the market. But stock splits are long out of favor except when it's to limit voting rights like Google did. They are recognized for the gimmick that they are. There is no longer a stigma of having a too high stock price. It's status now -- just look at all the multi-hundred $ and even thousand dollar stocks. That use to be reserved for Berkshire Hathaway. So forget about a stock split. Not happening. We should see a dividend increase. Apple has been doing that annually. Hopefully it will get back to a 2%+ yield with the repatriated money now available and not having to issue bonds for them. Buyback is possible Apple has been doing this regularly. I don't expect them to increase the effort more than they have been doing. Backbacks are also a bit gimmicky and have not proven to be a silver bullet for stock growth. I feel as though the rumors have given reason to think the iPhone X isn't doing well. While our expectations are low good numbers will look great. So, yeah, I'm sure numbers are fine. Show me the dividend increase. And pretty guidance for next quarter. I'm betting the iPhone numbers might not be as high as expected, but raw cash coming in from the App Store will be much higher than expected.